Welcome to the new home for Richcraft Studios. The new studio is ready and I'm excited to show you the production center that will support your custom voiceovers. The heart of the studio is an instance of ProTools to ensure professional quality recording and editing. 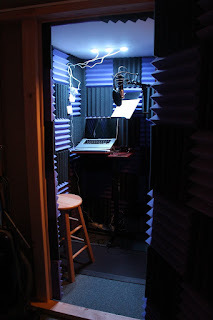 The studio itself is an acoustically isolated booth in a below grade room to take advantage of the earth's natural sound proofing. Richcraft Studios provides the voiceover recordings that help your projects make magic! "Barbara did a great job with our voiceover. She provided us with two sample takes to help guide which style we preferred, and turned around the final audio well before the agreed upon deadline. We will happily work with her in the future." "Another wonderful experience with Barbara! Quick, quality work as usual. Highly recommended voice talent." "The performance by Barbara made the Cecil family come alive as I listened to the story, and also gave me an idea how Kitty, Darcy, Colonel Fitzwilliam, Henry, Annie and many other beloved characters would sound. I especially have to congratulate Barbara for her singing as Henry during his proposal to Annie Reynolds, which was so sweet and romantic, and made this listener tear up." "Barbara Rich is a talented voiceover artist whose warm voice is a great addition to any voice over project." "Excellent Audio. Very sad, moving, beautiful story. Barbara Rich does an excellent job with the narration."